Married to one of the nations most popular presidents, Mary Todd Lincoln was, in contrast, not popular or well liked when she was the first lady. She was a women who was born wealthy and was use to getting what she wanted in life. She experienced a lot of tragedy in her life. Out of the four kids she had with Abraham Lincoln only one reached adulthood. She also sat right next to Lincoln at Ford's Theatre, where he was assassinated. All of the devastating losses in her life may have been contributing factors to why she suffered a deadly stroke at the age of sixty-three. The following facts and information serve as a short biography and give interesting details about the life of Mary Todd Lincoln one of the most famous women of the American Civil War. Click here for a great selection of Amazon.com books about Mary Todd Lincoln. Mary Lincoln was born as Mary Ann Todd on December 13, 1818, to wealthy slave owners in Lexington, Kentucky. As a child, Mary Todd Lincoln was sent away to boarding school where she received an excellent education for a woman during that time and even learned to speak fluent French. While living with her sister as a young woman, Mary Lincoln met Abraham Lincoln, an up and coming politician and lawyer who was nine years her senior. Mary Lincoln and Abraham Lincoln shared a love of literature and politics and a strong dislike for slavery. Mary and Abe Lincoln had an on again-off again relationship before finally getting married in November of 1842. 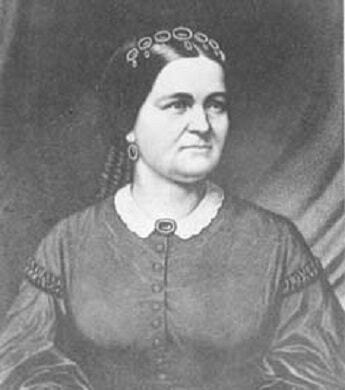 Mary Lincoln became the 16th First Lady of the United States at the age of 43. After Abraham Lincoln was elected President of the United States, Mary Lincoln was criticized for her extravagant spending habits. This made her quite unpopular as it was a time of hardship for much of the country. After Abraham Lincoln's assassination, Mary Lincoln did not take part in the funeral for her husband. She mourned in the White House where she remained for 40 more days. Mary Lincoln took her youngest son Tad and traveled abroad for three years in search of peace and the hope of leaving her tragic life behind. That son later died at the young age of 18. Upon her death, Mary Lincoln was buried next to her husband in Springfield, Illinois at the Oak Ridge Cemetery. She was buried with her wedding ring still bearing the inscription from her husband that said "Love is Eternal". At the age of just six she lost her mother shortly after the birth of her 15th sibling. Mary Lincoln's father eventually remarried giving her a very strict stepmother that did not treat her well. After living through three of her son's deaths and her husband's assassination, she became severely depressed. Her surviving son petitioned the court to have her committed to a mental institution and won. She was freed after several months but never repaired the relationship with her only living son. She died alone in her sister's house in Springfied, the same one she married her husband in forty years earlier. Mary Lincoln had spent all of her money by the time she passed away and died penniless.